News | Rhys Williams | Published: 15:06, Monday March 25th, 2019. A kebab shop in Abertridwr has won the ‘Best Kebab House in Wales’ category at the British Kebab Awards. Wales Kebab, which is located on Thomas Street, won the award at a ceremony in London on Monday, March 18. The kebab shop was one of two nominees from Caerphilly County Borough, and shares the award with Golden BBQ, which on Caerphilly Road in Cardiff. Charcoal Grill in Caerphilly town centre was one of the seven nominees in Wales. The ceremony was held at the Park Plaza Westminster Bridge hotel in London and was attended by more than 1,000 guests, including more than 100 Members of Parliament and the House of Lords. 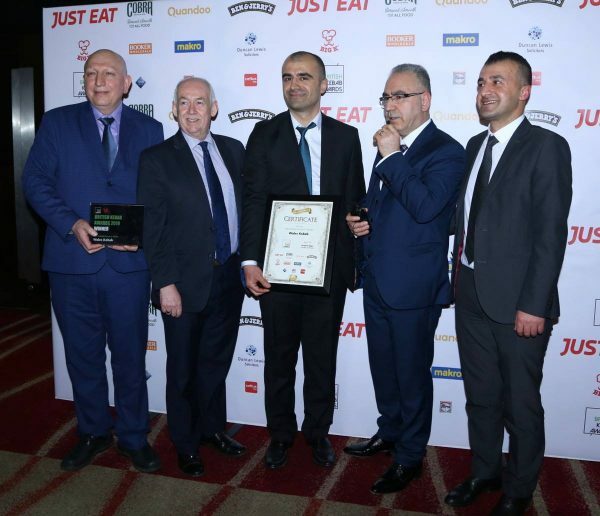 Cemil Guzel of Wales Kebab said: “I am grateful to have won. We’ve worked hard for it. The winners were judged by a panel which included politicians, journalists and industry experts. Labour leader Jeremy Corbyn was also at the event, which was hosted by Scott Mills.